Caulking windows—to give them a finished look (inside and out) and seal out leaks and drafts—is a fairly common DIY task. But if done incorrectly, it can lend a sloppy, amateurish look. Caulk is not a design element; it should blend in with the window and be unnoticeable. “Running a bead,” as the process of caulking is known, requires applying a long, narrow strip along the entire length of the seam—and it takes a degree of skill. Keep reading to learn the techniques so you can caulk like a pro. DO choose the correct caulk. You’ll find dozens of types of caulk at your local home improvement store, and each type is intended for a specific situation. Exterior windows: To stand up to the elements, exterior caulk should be impervious to harsh sun rays, water, and fluctuating temperatures. The tube of caulk should specify it’s intended for exterior surfaces; we like Sashco Big Stretch Caulk (available from Amazon). Interior windows: Caulk used on interior windows should not emit toxic fumes, and it should hold paint well. High quality, paintable latex, such as White Lightning’s Painter’s Preferred Acrylic Latex Caulk (available from Amazon), is a good choice for interior windows. Humid rooms: Caulking windows in a room with high humidity, such as a bathroom, calls for interior caulk that’s both waterproof and mold-resistant. Kwik Seal Ultra (from The Home Depot) works well in steamy situations. Masonry siding: When caulking seams between windows and masonry siding, including basement windows and windows on stucco or brick homes, you’ll need an exterior caulk that’s compatible with both the window and the masonry surface. General Electric Max Flex Acrylic Urethane Caulk (available from Amazon) is a solid option for these types of uses. DON’T caulk over old caulk. If the existing caulk has hardened and is pulling away, running a bead over it is sure to be an exercise in futility. 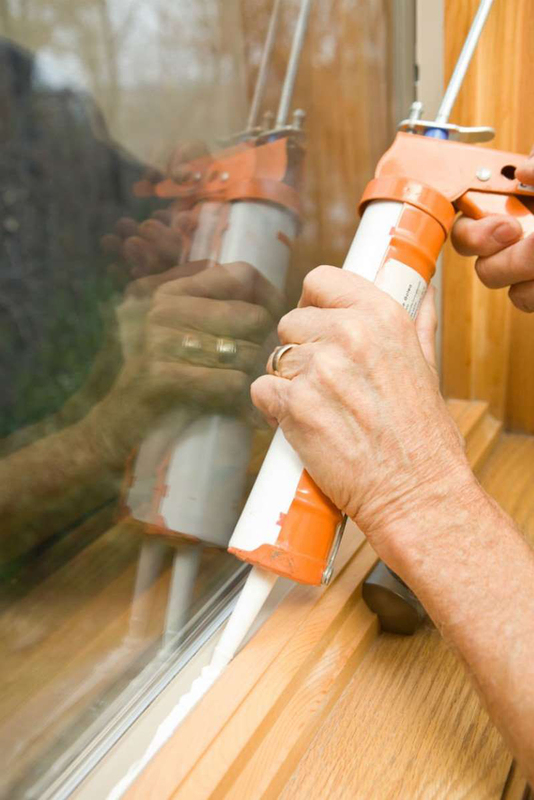 The old caulk will continue to pull away, taking the new caulk off with it—and before that happens you’ll be faced with a thick, messy caulk line that detracts from the look of the window. Scrape off the old caulk with a steel putty knife, such as HYDE’s 1-1/2” Flexible Stainless Putty Knife (available from Amazon). DO use a caulking gun with a thumb release. Cheap caulking guns come with a ratchet-style handle that must be twisted loose to release the pressure on the caulk in the tube. With this type of gun, caulk will keep oozing out until you loosen the handle with your hand, resulting in excess caulk on the window. A better choice is a caulking gun with a thumb release you can press to instantly release the pressure on the caulk so it stops flowing when you’re done running a bead. We like Newborn’s Superior E-Z Thrust Smooth Rod Caulking Gun (available from Amazon) for its convenient thumb release. DON’T cut too much off the end of the caulk tube tip. 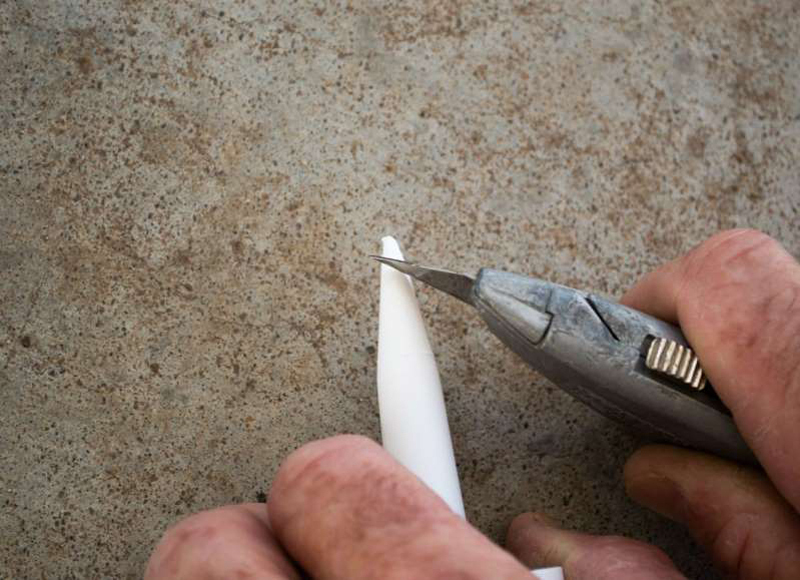 The plastic tip on a caulk tube narrows to a point, and the more you cut off, the larger the bead of caulk will be. Some tubes come with measured cut lines on the tip, allowing you to select the one that most closely matches the width of the seam; others are unmarked. The best practice is to cut off just the end of the tip, and then squeeze out some caulk to see the size of the bead. You can always cut off more, but if you cut off too much at first, your bead will be too thick for the seam. DO use both hands to run a bead. It takes two hands to control a caulking gun. Use your dominant hand to hold the gun and pull the trigger, and support the barrel of the gun near the tip with your other hand. Also be sure to keep your wrists straight, moving your elbows and body when running a bead. For example, if caulking a vertical seam, start at the top and as you progress downward, bend your elbows—or knees—to caulk lower while maintaining your wrist position. Bending your wrists would alter the angle of the caulking gun, changing the appearance of the bead. DON’T run a continuous bead from the top to the bottom or from one side to the other. By the time you reach the end of the bead, you’ll have to change your grip on the caulk gun, which will affect the uniformity of the bead. Rather, caulk from one end to the middle of the seam and stop. Then, start at the other end and caulk to meet the first bead. This will allow you to maintain a steady hand position, which will result in a uniform bead. 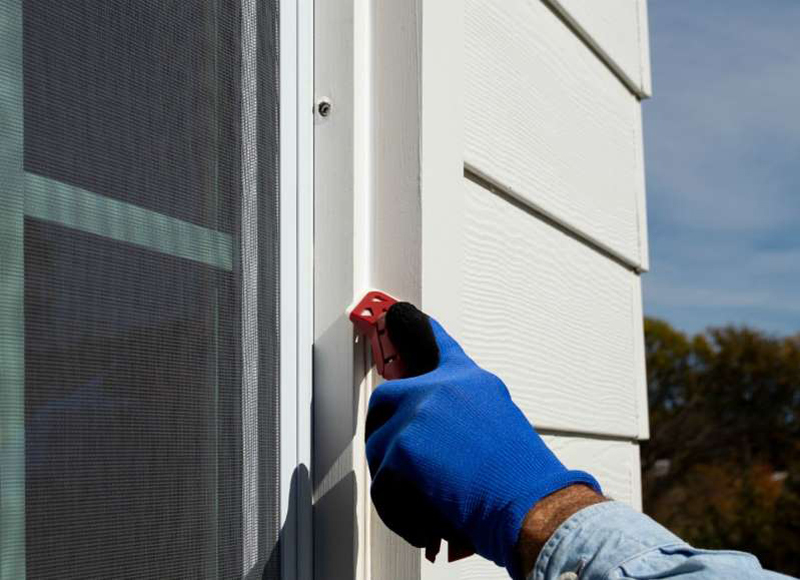 DO ride the smooth edge when caulking a seam between a window and textured siding. Siding is often textured, and if you slide the tip of the tube along the bumpy texture, the bead of caulk will also be bumpy. The solution is to allow the tip of the tube to slide, or “ride” as the pros say, only along the smooth window edge. Keep the tip from riding the textured siding as you’re running the bead. The caulk will still seal the seam and you’ll have a better-looking bead. DON’T smooth the bead of caulk all the way from one end to the other. After running the bead, you’ll want to smooth it, either with a wet finger or caulk applicator, such HYDE’s Caulk-Rite Pro Application Tool (available from Amazon). The best way to smooth the bead is to start about six inches from the bottom and smooth that small section first. Then, move up another six inches and smooth that section next, pulling downward toward the section you just smoothed. Amateurs often try to smooth the entire bead at one time, which causes excess caulk to build up and overflow on the sides of the seam. Smoothing just a small section at a time will give you a professional look and prevent a mess of excess caulk on the sides of the seam. It takes caulk a couple of hours to start drying, so you should have ample time to smooth in this manner. DO tape off your seams if you can’t run a smooth bead. If your hands are shaky or you just can’t seem to move the caulking gun smoothly enough to run a uniform bead, you can still obtain good results by taping off the seam with painter’s tape. Simply attach strips of painter’s tape along both edges of the seam, approximately 1/8” away from the seam itself. Then, run the bead of caulk and smooth it off as described above. As soon as you’ve smooth the bead, carefully pull off the painter’s tape and you’ll have a perfect 1/4” caulk line. DON’T use caulk as a filler for poorly trimmed-out windows. Caulk is intended for use on relatively narrow seams, typically 1/4” wide or tighter. If applied to large gaps, caulk can sag out of the gap and create an unattractive mess. If you have gaps wider than 1/4", the best practice is to fill them first with a foam backer rod, such as this C.R. Laurence Closed Cell Backer Rod (available from Amazon) and then run your bead of caulk.